This classic purée of carrot soup, called potage Crecy in France, is vibrantly colorful and aromatic. It has few ingredients, and carrots are the star, but the carrots are not overpowering. No flavor seems to dominate. All ingredients in this recipe come together to form a delicate, balanced mouthful of flavor. This soup is made using the basic procedure for making pureed soups and is thickened by the natural starch from the carrots as well as added potato. 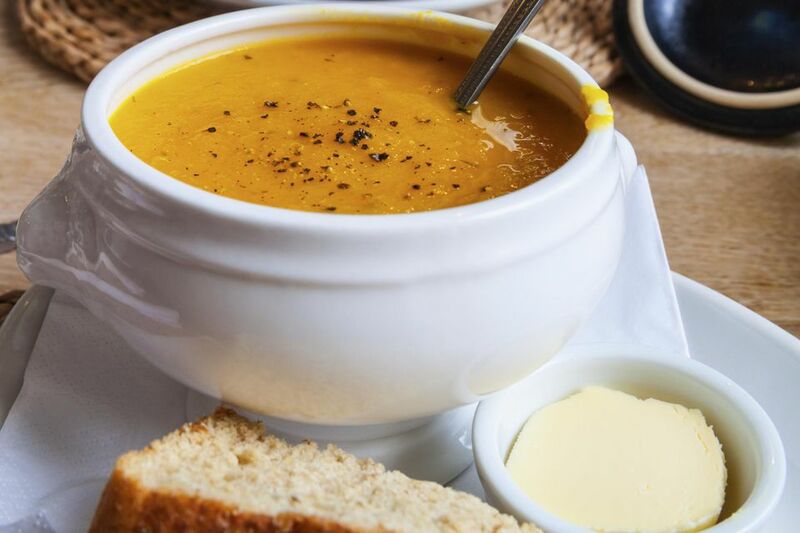 "Potage" is the French term for a thick, creamy soup that is often puréed, and Crecy is a place in northern France known for producing some of the country’s best carrots. If you cannot source your carrots from Crecy, then go for slender, fresh looking carrots, preferably organic. Larger, thicker carrots can often be tough. Peel the carrots and trim the top and bottom ends. Cut carrots into (roughly) same-sized pieces, about 1/2 inch to 1 inch thick, depending on diameter. Do not worry about precision—the soup is going to be puréed anyway. You want the pieces to be of uniform size so that they cook evenly. In a heavy-bottomed soup pot, heat the butter over low-to-medium heat. Add the onion, garlic, and carrots and cook for 2 to 3 minutes or until the onion is slightly translucent, stirring more or less continuously. Add the stock and the potato. Increase the heat to medium-high and bring to a boil. Then, lower the heat and simmer for 15 minutes or until the carrots and potatoes are soft enough that they can easily be pierced with a knife. Do not let them get overcooked or mushy. Remove from heat and purée in a blender, working in batches if necessary. Use care when processing hot items in a blender as the hot steam can sometimes blow the blender lid off. Start on a slow speed with the lid slightly ajar to vent any steam, then seal the lid and increase the blending speed. Season to taste with kosher salt and white pepper. Garnish with a toasted crouton and serve right away. Ginger-flavored carrot soup: Add 1/4 cup of minced fresh ginger at the point in the recipe that you add the onions and garlic. A hint of thyme: After puréeing, add 1 tbsp. of fresh thyme leaves before bringing the soup back to a simmer. Make it creamy: Stir 1/4 cup hot cream into the soup just before serving. Thicken it with rice: The soup can be thickened with rice instead of potato. Substitute about 1/3 cup of uncooked rice for the potato, and simmer the soup until the rice is soft.